The following image is a stacked composite of 8 frames taken with a Panasonic DV Camcorder by Graham Ensor through his 80 year old Watson and Sons 'Century' 3 inch brass refractor. The observations were made around 2 am on 16th July 2003 from Swannington in Leicestershire. Graham comments: "The image I captured was dancing around like mad and moving at a fair rate as my scope isn't driven but I managed to work through the best of the video and capture about a dozen stills and import them into Photoshop (I tried stacking the jpegs with astrostack as the new version is now able to deal with them but still found that the results were better in Photoshop... possibly because there was no really sharp details for astrostack to use). I stacked only 8 shots and used Photoshop to proccess the images....doubling the pixel count, smoothing and sharpening as I went. No colour correction was performed.". The result shows the potential of this method of observing, with the south cap obvious but also some darkening near the cap, a clear difference between the sharper disc edge and the less defined shadow edge making the disc slightly oval (Mars not being at opposition at the time of this observation) and a hint of colour in the north. Graham comments further: "This was a practice run for future observations as Mars grows....with better viewing conditions and a little luck I'm hoping to capture more detail". The following sketch of Mars combines observations made by Mike Lancaster on the nights of 29th-30th and 30th-31st August 2003 using the 10" f/8 Newtonian reflector at the Society's Flamsteed Observatory. Magnification was 206x using a 9.7mm Meade Super Plossl eyepiece. The south polar cap is visible in the 11 o'clock position. The prominent dark triangular feature in the centre of the disk is Syrtis Major, with Mare Tyrrhenum stretching towards the limb at left (west). Extending above and to the right of Syrtis (i.e. to the south-east) is a forked dark marking comprising the Mare Serpentis (left/south) and Sinus Sabaeus (right/north). Sinus Sabaeus terminates in a club like feature called Sinus Meridiani, just visible near the eastern limb. Between Syrtis Major and the south polar cap is a barely visible bright patch which corresponds to the Hellas basin. The following image of Mars is a stacked composite of about 12 frames taken with a camcorder by Graham Ensor through Mike Dumelow's 8" Dall-Kirkham telescope at 01:00 UT on the 5th September 2003. The images were stacked and enhanced in Photoshop using a variety of levels and filters. As a result a remarkable amount of detail has appeared. This image is oriented with the south polar cap of Mars at the bottom. Syrtis Major is visible as the dark triangular region in the upper middle part of the disk, with Sinus Sabaeus and Mare Serpentis projecting towards the limb the left. 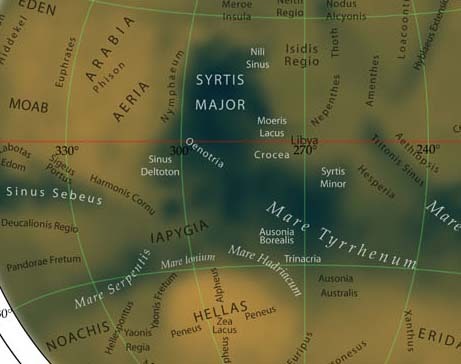 Mare Tyrrhenum is to the right of Syrtis Major. 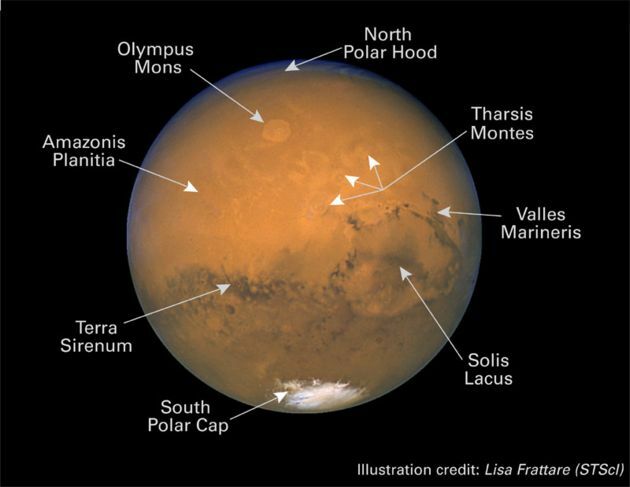 Compare the image with the map of this area of Mars below. 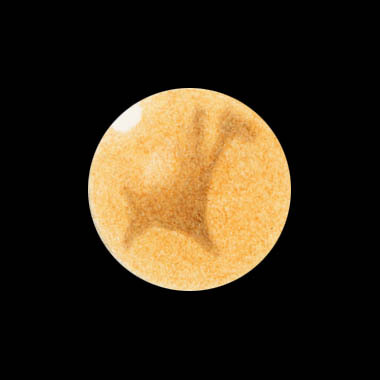 Even the dark projections of Sinus Deltoton and Syrtis Minor either side of Syrtis Major are hinted at in Graham's image. 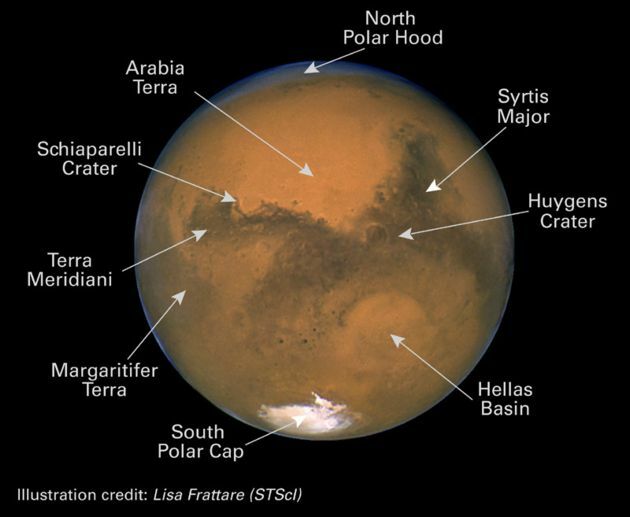 The bright area between the south polar cap and Syrtis Major is Hellas Planitia. The bright area at upper left is Arabia while Isidis and Utopia Planitiae are at upper right. 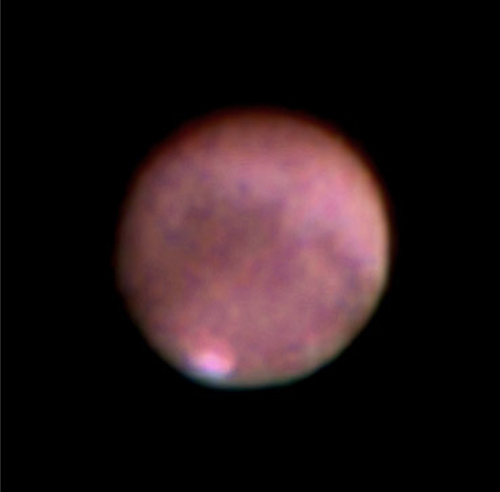 The following image of Mars was captured by Tony Razzell on 13th September 2003 at 23:01 UT. It is a compilation of around 15 separate images taken with a black and white web camera (Connectix QuickCam) attached to a homemade 6" f/8 Newtonian on a driven mount. A barlow lens was used to give an effective focal length of about 3 metres. Tony also comments that the seeing was poor. The overall exposure time was less than 1 second and no dark frame correction was used. The vertical stripes are an artifact of the camera. The south polar cap can just be seen at the top of the image. 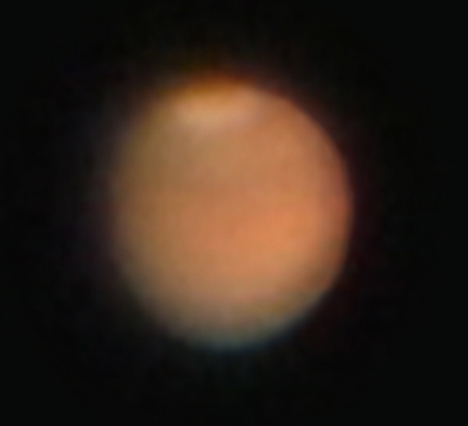 The following image of Mars is a stacked composite of 4 video frames taken at around 23:00 UT on the 25th September 2003 by Graham Ensor through Mike Dumelow's 8-inch Dall-Kirkham telescope. The video frames were taken through a Mantis EE240 USB webcam with the lens removed and a film canister attached so it could be inserted instead of an eyepiece in prime focus mode. The CCD chip was of 640x480 resolution at 8 frames per second. The video frames were chosen for quality and stacked manually in Photoshop. Graham undertook extensive processing using curves, levels, sharpening and resampling both before and after stacking in order to bring out the detail seen here. When referenced to the map and Hubble Space Telescope images below many features can be recognised. These include Margaritifer Sinus, Sinus Meridiani, Sinus Sabaeus and Oxia Palus. The south polar cap is clearly visible at the bottom of the picture. 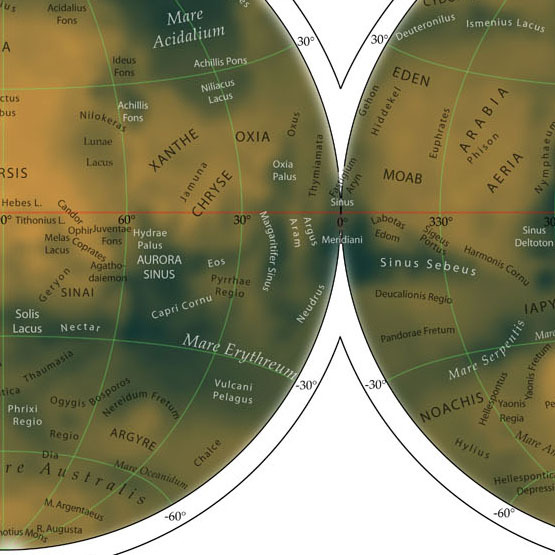 Solis Lacus is just on the left edge of the disk, with a dark line running around it and up to the position of Valles Marineris (compare with the Hubble Space Telescope images underneath the reference map below). There are also a few dark markings corresponding to the Achillis region at the top (north) of the disk and hints of darker tendrils running up towards that region around Hydrae Palus from Aurorae Sinus. There is even a hint of indentation which could be the crater Schiaparelli. Judge for yourself! The following pictures are two Hubble Space Telescope (HST) views of different hemispheres of Mars. Like a rambler who finds that their walk spans two maps, the left hand portion of the top HST image corresponds to the right hand portion of Graham Ensor's image, while the right hand portion of the lower HST image corresponds to the left hand portion of Graham's image! 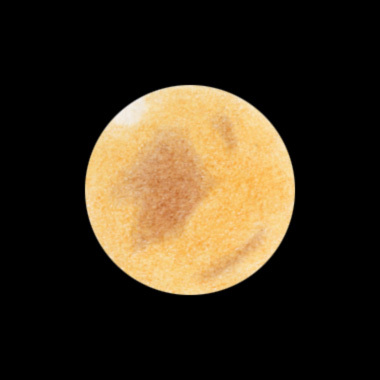 The following sketch of Mars was made by Mike Lancaster on 26th September 2003 at 23:00 UT using the 10" f/8 Newtonian reflector at the Society's Flamsteed Observatory. Magnification was 206x using a 9.7mm Meade Super Plossl eyepiece. The main dark area comprises Margaritifer Sinus to the left, Mare Erythraeum (centre) and Aurorae Sinus (to the right). The detached dark patch at top right is either the Solis Lacus or possibly part of the Mare Sirenum. The dark patch towards the limb at lower right (north) is the Mare Acidalium. The south polar cap is visible at top left.